Thirteen-year-old Merilee Monroe maintains a Very Ordered Existence, VOE for short. As long as she keeps up with her minute-by-minute daily schedule, she can avoid the internal trauma caused by change and spontaneity. So when two very distracting newcomers arrive in town, Merilee does her best to ignore them and stick to her plans. But can even a VOE have some room for friendship? 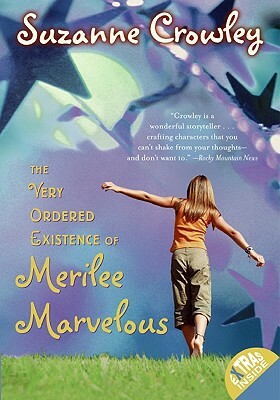 Suzanne Crowley is the author of two acclaimed novels for young readers, The Very Ordered Existence of Merilee Marvelous and The Stolen One. The author, who is also a miniaturist and dollhouse collector whose work has graced the covers of magazines worldwide, was born in a small town in Texas and lives in Southlake, Texas.